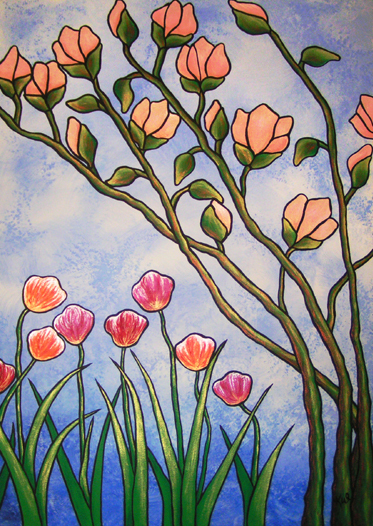 This is the second large painting I did (a little while back) which was inspired by floral Tiffany glass works. I was really IN to and was collecting Tiffany lamps and have loved that colorful glass art medium for quite a while. I didn’t do as many Tiffany inspired paintings as I planned (the usual for me – too many ideas, too little time – and energy). I don’t know if Magnolias are ever truly peach, but, in my fantasy world, they come in every color, just like other flowers do. Well, so do animals and people – why not in every color? In one’s imagination, everything is possible, right? This painting hangs in a front room of our house next to the somewhat similar Irises on Blue, a sort of companion piece, swaying the other way (it is the magnolia theme that ties them together). I’ve never been one to paint flowers much at all, but Tiffany glass artworks sparked the desire to jump in and try a few favorites.